Water storage. Flood control. Hydropower. Transportation. Those attributes of dams have built the West and its economy during the past century. By developing the potential of the Columbia and Snake rivers, the Colorado River and other rivers around the West, we have seen the deserts bloom, seen cities thrive and fueled an economic engine that is the envy of the world. The 1,214-mile Columbia River empties more water into the Pacific Ocean than any other river in North or South America, according to the U.S. Geological Survey. Including the Snake River and its other tributaries, the Columbia drains 219,000 square miles across seven states and western Canada. The 1,450-mile Colorado River is the life blood of much of the West. Its 246,000-square-mile watershed also covers seven states, and it provides water and electricity to much of the Southwest. The dams on those and other Western rivers have transformed them into the region's greatest assets. Before the Columbia River was dammed, its catastrophic floods wiped out entire communities. Only after the U.S. and Canada reached a treaty -- and built more dams -- was the river made safe and navigable. The electricity the Columbia dams produce powers much of the West, including Canada, and the water from its reservoirs nourishes farms and ranches throughout the Northwest. Barges use the river to transport grain, coal and other goods and commodities to market and carry fuel and other supplies to inland destinations. The taming of these rivers is an American success story. Without the dams, the West would be but a shadow of what it now is. The problem is that many of the dams are aging. Two-thirds of them are more than 40 years old. Large and small, many need to be updated, repaired and, in some spots, replaced. Doing that won't be easy, or cheap. But it is necessary nonetheless. It would cost $16 billion just to repair every high-hazard dam in the nation, according to the American Society of Civil Engineers. At the same time, this presents an opportunity for our nation. Instead of just tearing out dams -- as some critics suggest -- we should repair, replace or update them as needed to store more water and produce more electricity. 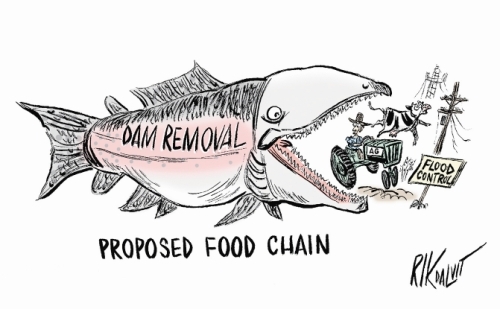 The dams should also be built or modified to accommodate fish passage for endangered species. If predictions of global warming are correct and the annual mountain snowpack shrinks, we will also need massive amounts of additional water storage -- including more dams -- to quench the West's thirst. Hydropower is, in every sense, sustainable. Columbia River water that flows through the turbines of Canadian dams will repeat the process many times as it travels to the Pacific Ocean. About 60 percent of the region's electricity comes from hydropower, according to the Bonneville Power Administration. Hydopower is also the perfect complement to wind and solar power. On calm or cloudy days, power from dams can supplement that produced by wind and solar farms. On other days, dam flows can accommodate fish passage, irrigation or both. Some of that water is used for irrigation. Across Washington state, Oregon and Idaho, Columbia and Snake river water irrigates potatoes, onions, row crops, grapes, hay, forage, sugar beets, corn, wheat -- you name it and river water helps it grow. The Colorado River supplies the same miracle of life in Arizona, California, Nevada and other Western states. The West needs updated, high-tech dams that will continue a legacy of economic and environmental improvement for future generations.